Psst… We’re giving away a FREE ticket to Lánzate! Enter our Bumper Sticker Design Contest for a chance to win! 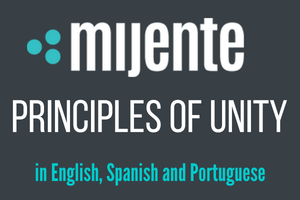 The Mijente familia is growing bigger than ever and we’re leveling up our swag + bienvenida with a custom Mijente bumper sticker designed by… YOU! 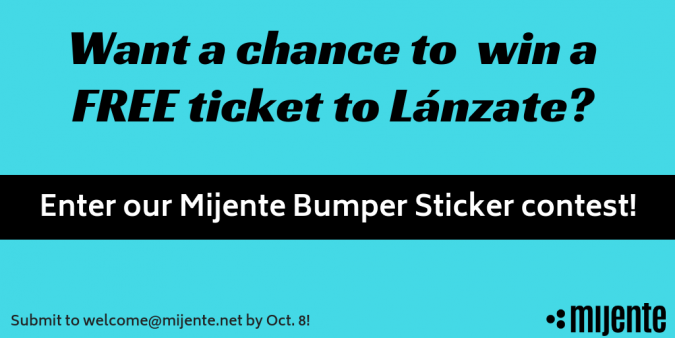 Enter Mijente’s first ever bumper sticker design contest for the chance to win free entrance to Lánzate 2018. Submit your message and/or design that captures the sazón y diversidad of our gente to be Mijente’s newest sticker! Bumper stickers can speak to what we care about, share a taste of our sazón and invite others to get curious. And they can be a tool to rep our political home. Contest begins today and ends on October 5th at midnight. Aligns with our pro-Black, pro-queer, pro-woman, pro-worker y mas values and our Mijente Principles. Speaks to our Mijente membership and Latinx community. Creative, humorous, inspiring messages/designs encouraged. We look forward to seeing your beautiful designs!